George Clooney is making a huge mistake. The man who claimed he’d never marry again is set to marry Sarah Larson in Italy…secretly. A super-celeb like Clooney trying to marry in secret is like having a full-scale fireworks display inside your garage so the neighbors won’t notice. A source in Laglio, the town where Clooney has a villa, says: ‘They haven’t made any announcement yet, but there are people in this town who know more than me. They say the couple are already engaged.” Fare thee well, George. The cold, dark embrace of wedlock awaits. 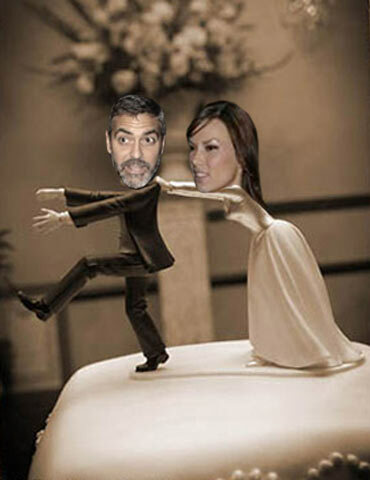 The Derobers have an exclusive photo of the wedding invite below! Nobody ties George Clooney down. NOBODY! Clooney and Fabio fight. Derober’s exclusive photos. crazy. didn’t he have a bet with a certain actress for 10,000 bucks he’d never marry again?